We hosted a Local Roundtable where we discussed the continuing crisis of violence and homicide in Baltimore. With: longtime citizen activist Kim Trueheart, former candidate for Baltimore City Council President; Lawrence Grandpre, Director of Research at Leaders of a Beautiful Struggle; and former City Councilman Carl Stokes, founder of Banneker Blake Academy of Arts and Science. Even if the police are taking a knee, police can only do but so much – they are mainly reactive not proactive. Zero tolerance was an attempt at being proactive. Crimes can’t be solved, if no one is willing to provide information and testify. Usually the people who witness a shooting, is directly or indirectly involved. Criminality has a close knit community. If someone gets shot they don’t go to the police they retaliate.That accounts for a large percentage of shootings. 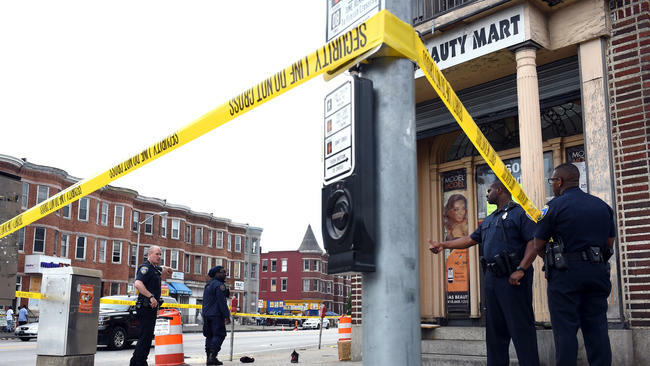 There is a culture of violence that exist in the criminal element of the Black community in Baltimore, that does not appear to be present to the same degree in other groups. Poor Whites are as heavily involved in drugs, but we don’t see the same number of shootings and homicides around their involvement with them. A lot of money is made via the drug trade, so is it really about having an income? I believe a ‘Marshall Plan’ type of effort is needed to end this public health plague or epidemic. Listening to the Congressional hearing today on the Opioid epidemic, it sounds like this is the approach they will be taking. Why can’t these two issues be combined, and the funding be allocated for both? They spoke of teaching children in school, about this problem and it’s dangers. The same should be done for African-American children and the cycle of poverty, drug use, and violence. The teaching needs to be holistic. The youth need to understand what is at stake for us as a society and the consequences for the future, if this continues. They have to understand the value of resources/money in this present economy, that will exist for the foreseeable future, because we live in a much more competitive world than in the past. We need positive returns on our investments, more so than ever. We have an infrastructure that has to be rebuilt, an aging population that will put a strain on the health-care budget. What will they inherit in terms of quality of life, and in terms of a national debt, if we continue in the manner we are? I advocate we appeal to all Americans the efficacy of a ‘Peace Dividend’ simply calling for their cooperation to stop the violence and self destructive behavior so we can use our resources to produce a healthy,peaceful, harmonious, equitable and just society if not for us, for our children. In terms of simply things that can be done tomorrow, how about a public service campaign like the one years ago that asked “It’s 11:00 – Do you know where your children are?”. Maybe a message saying ‘Stop the killing. The life that’s saved may be your child’s, sibling’s, friend’s, parent’s, etc.” It’s sad that the slogan “If you see something say something” only applies to terrorist related things. We hear it every day on the subway, but no one will dare correct school kids on public transportation being disruptive or disrespectful. This is the culture that has developed over time. Our sense of community has diminished significantly. Are we willing to admit it? We all agree that children and the schools are fundamental and paramount in solving this problem, but what of parents, who are raising the children? An effective parent has to have some basic values that are consistent with the norms of society. Many people don’t process these today. They seem to have a survivalist mentality, and will do so, by any misguided self destructive means necessary. I personally believe America has a cultural problem of getting high – has for a long time, and it’s getting worst. Some think it’s not a problem and that it can be managed. Pretty soon recreational Marijuana use will appear on more ballots around the country. Black people don’t have long to get their act together. Our young people already smoke Marijuana right out in the open in public going to and from school. It’s smells terribly, so the schools must be aware of it. Many of our children are underachieving, and have no respect for authority, or concern about being disciplined. They make the mistake of thinking they can do it just because they see White people do it, knowing they will not be ignored by police like Whites are. They are already faced with unfavorable circumstances. When they screw up their life they will be looked upon as a criminal, a problem, and a burden, while their counterparts will be viewed as a sick victim of societal pressures – just as this fight against the opioid epidemic is proving to us. How many of these shootings are done by people under the influence of drugs. We certainly know a significant number of them happen in some way because of drugs. The response to this violence epidemic must be national in scope, and tied to the opioid epidemic. They both are decimating communities one way or another.